"And it is God who establishes us with you in Christ, and has anointed us, and who has also put his seal on us and given us his Spirit in our hearts as a guarantee" (2 Corinthians 1:21-22). When this letter was written to the church in Corinth, the Apostle Paul had planned to come visit the brothers and sisters there before going on to Macedonia (1:15-16). His plans, however, were thwarted. He did not come to see the church in Corinth as he had originally intended. This opened the door for accusations against Paul, inciting grumbling against him as unreliable and untrustworthy. Paul makes it clear to these young believers in Corinth, though, that his plans (his "yes") and his failure to carry out his plans (his "no") are in no way characteristic of God, for what He promises will always come true. Job 42:2 bears witness to this quality of God: "I know that you can do all things, and that no purpose of yours can be thwarted." In verses 21 and 22, Paul says that "it is God who establishes us (Paul and Timothy) with you in Christ." Paul is referring to the unity of the family of God made possible by the establishment in Christ. Notice, too, that the verb "establish" is not past tense. On the contrary, Paul says that it is God who "establishes us with you." This is important because the Lord is not finished with us at repentance and belief in His Name. He establishes us with our brothers and sisters, unifying us through the sanctification of His Holy Spirit. The work of sanctification is never complete, but it guarantees us of our salvation from sin and our life in Christ by the grace and power of God. "... in Christ...." On these two words hinge every moment in history and every moment still to come. God establishes us within His family "in Christ". God's plans can never be thwarted. Once He establishes a person (or in a broader sense, "people", namely His Body/Bride) they are forever established and they continue to be established. How is that possible? God is eternal. There is no past, present, or future with Him. He establishes us, roots us in Christ. And those whom He has rooted in Himself know it because of the "guarantee". And who does God give us as our guarantee, as our down payment? The Holy Spirit. 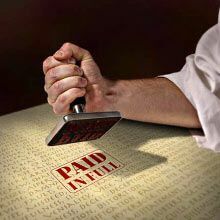 Those whom He establishes in Christ through His grace are now sealed with His Spirit as a down payment of what is to come. And what is to come? Eternal life. An eternity full of the knowledge of the one true God in an intimate relationship. John 17:3 says, "And this is eternal life: That they know You, the one true God, and Jesus Christ whom You have sent." Those whom Jesus has called to salvation can never lose their establishment in Him. We will prove to ourselves and to one another that we are truly in the faith if we continue in His establishment. If we do not, we know that we are not saved. If we do, then we know He has given us the grace to persevere in His grace. God's Word is not flippantly given as man's word often is. For even when Paul the great apostle said "yes", his plans were thwarted. But when God says "yes", you can be certain of this: His plans will never be thwarted. "And those whom he predestined he also called, and those whom he called he also justified, and those whom he justified he also glorified" (Romans 8:30). By His grace and love, He will see the believer through all trials and tribulations, all persecutions and difficulties. Oh Christian, may you continue in the perseverance of the faith given to you at salvation, knowing that it is God who both establishes and guarantees us. Oh Sinner, may you find salvation today by answering his call to repentance and belief in His Name. "Whoever confesses with their mouth that Jesus is Lord and believes in his heart that God raised Him from the dead, they shall be saved" (Romans 10:9). "I know that you can do all things, and that no purpose of yours can be thwarted" (Job 42:2).